Patna, March 20: Amid reports of ongoing tussle between Congress and RJD over seat sharing in Bihar, RJD leader Tejashwi Yadav on Wednesday said that the Bihar "Mahagathbandhan" (grand alliance) is 'intact' and formal announcement of seat sharing arrangement among the allies would be made after the Holi. "The Mahagathbandhan is intact and strong and who will contest from where and the Lok Sabha constituencies will be announced formally after Holi. There is nothing to worry, and all is fine in the alliance," said Tejashwi Yadav. Sharad Yadav of Lok Jantantrik Party said formal seat sharing announcement for the Lok Sabha elections in Bihar will be made on March 22. "Mahagathbandhan will do a press conference in Patna on 22nd March to formally announce the seat sharing in Bihar," said Sharad Yadav. 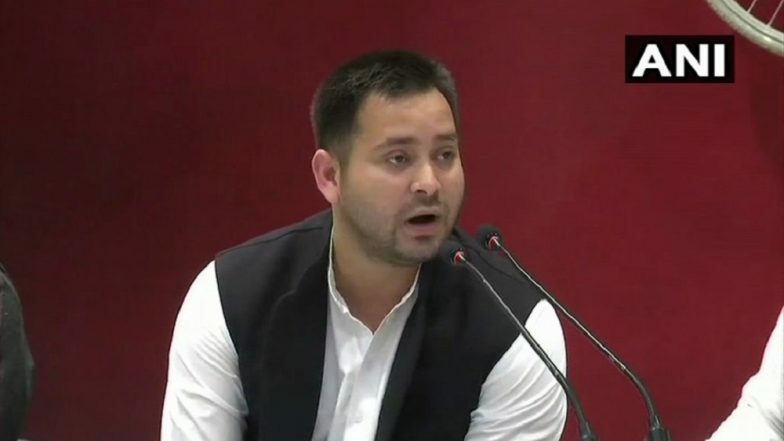 Lok Sabha Elections 2019: Tejashwi Yadav Backs SP-BSP Alliance in Uttar Pradesh, Says 'Our Motive is to Defeat BJP'. "Talks regarding the seat sharing in Mahagathbandhan has almost been finalised. I only intervene if they need my help, else the people from the Congress and RJD are largely involved in the talks and settle it among themselves," said Sharad Yadav. The issue of alliance between Congress and RJD has been dragging for some time as RJD is not ready to give more than eight Lok Sabha seats to Congress which had already announced its candidates on 11 seats for the ensuing polls, sources said on Sunday. The grand alliance formed by the Opposition in Bihar includes the RJD, Congress, Rashtriya Lok Samta Party (RLSP), Hindustani Awam Morcha (HAM), Lok Jan tantrik Dal (LJD) and Vikas Sheel Insaan Party (VIP). Bihar will go to polls in all the seven phases on April 11, 18, 23, April 29, May 6, May 12 and May 19. The results would be announced on May 23.